Cliff Meyer of Meyerbuilt Metalworks on how Indiana’s racing cultures affects his designs, why his bikes don’t ride like sofas, and the reason he’ll never use fiberglass on one of his builds. Well, I’m in my early 30’s and I’m a Pediatric ICU Nurse by day/night. I do all the metalworking stuff in my spare time. I’ve recently made arrangements to have a bit more spare time to do this kind of stuff. 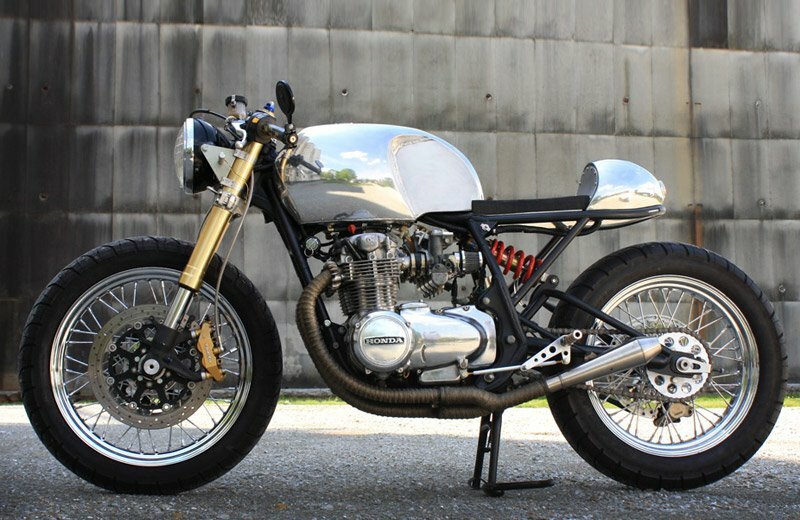 Things have picked up since my CB550 hit the internet. I’m a dad and husband, so spare time might not be the best word to use!! How did you get interested in building bikes? I got into bikes while I was in college for my first degree. Cliche, but I was watching American Chopper. I thought all the welding and metalwork was cool and figured I could do that if I tried. So I slowly began to teach myself how to do things. I also had some help from my great-uncle Jerry Schwarz, he was one of Carroll Shelby’s chief mechanics and fabricators. I worked part time for a few years at a small race/fabrication shop, and then did bicycles and other work in my garage. It wasn’t until recently that I jumped into motorcycles…probably 4 years ago. My design process is pretty simple. I like to have lots of customer input. I then take what I know I can do and what they want and meld that together. There hasn’t been much yet that a customer has wanted that I wasn’t able to do. That being said, I will NOT mount a fiberglass piece on my projects!!! It’s metal or nothing…and I’m not afraid to tell people that. I try to focus on safety also. I know custom is cool, but safety is most important. If it’s not something I would ride, I certainly won’t let a customer ride it. What I spend the most time on with my bikes is the fit/finish. There are certain things I see on other bikes that I don’t like, like a slightly crooked tail piece, large gaps between the frame and seat…etc. 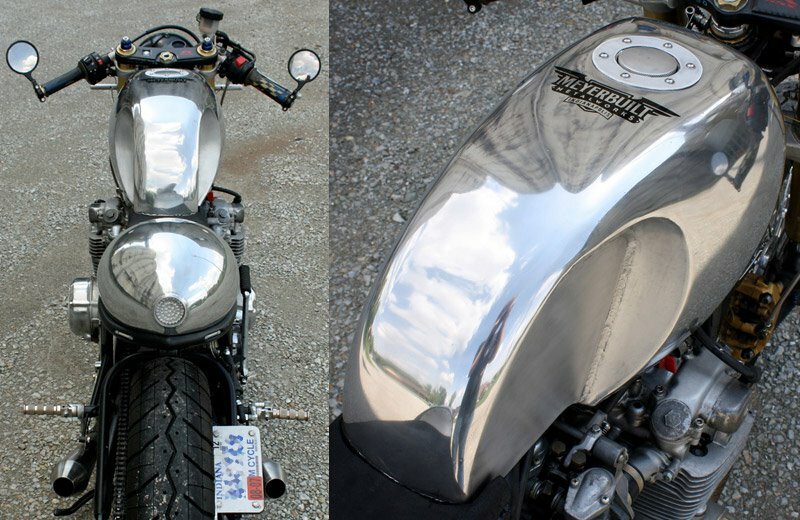 I try to make my stuff look like it was always made to fit on the bike…not an aftermarket piece. When looking at a bike for the first time, what do you focus on? When I look at a bike for the first time, I try to find lines that are naturally there on the bike….then emphasize the ones I like. It appears to me that a bike has its own flow to it even before I start to work on it. Sometimes changing that too much can turn out poorly. I also try to see the bike for what I want to make it…or see it from the personality I want the bike to have. 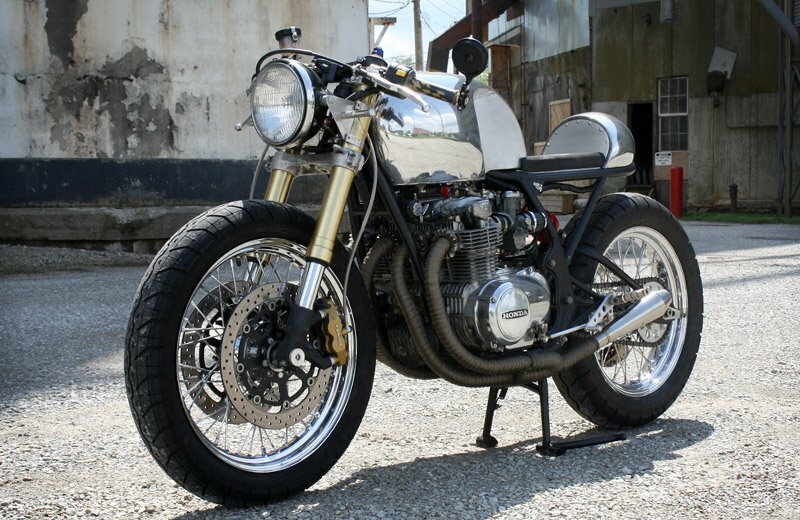 For my CB550 cafe, I wanted it to have this muscular shoulder look to it. I kinda wanted it to look like the bruiser kid on the playground. That’s where the larger wheels and tires came in…along with the beefy tank. How does Indiana and its racing culture affect your designs? Indiana’s racing culture affects my designs in the fact that I don’t really put much on the bike that doesn’t need to be there. 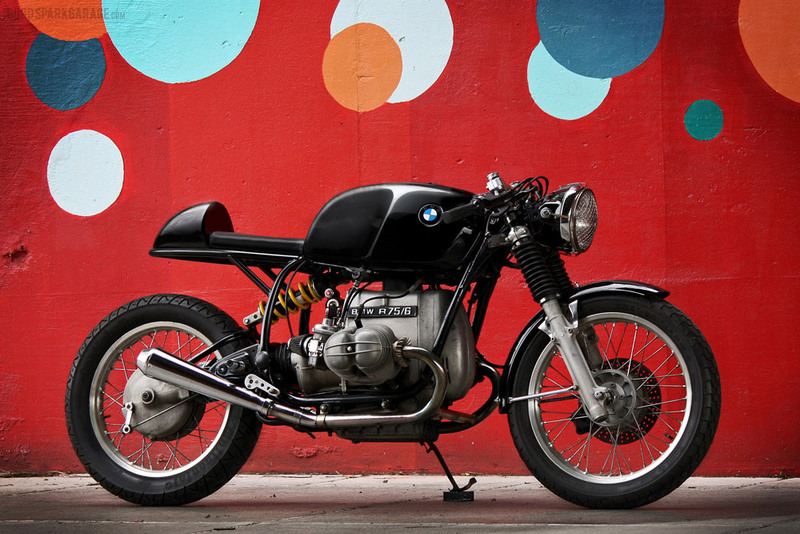 I prefer to just make a bike for what it is…riding. I’m just now beginning to step outside my comfort zone and get more creative with my metalworking. I tend to make things as purpose-built as possible. From my bikes, I like to have an aggressive ride. I like to think that my bikes reflect me a bit. I’m not a sit down and relax kind of guy, so my bikes don’t ride like sofas! I’m short statured and wirey?…if that’s a word. So my bikes are quick and nimble. I have built two choppers, but they were rigids and handled well. Since then I’ve done cafes that have been pretty sporty. Most inspirational bike you’ve ever seen and or rode? I’ve only ever ridden 4 motorcycles…the ones I’ve made. I don’t ride other people’s bikes….too scared to put a rash on them! I’m setting here trying to think which bike is my most inspirational, and that really depends I guess on the genre I’m working on. But I will have to say that my favorite bike at the time of my start in bikes was Hank Young’s Flying Pan. His fabrication skills and building style were very inspirational to me…and still are. Best compliment you’ve ever received about one of your motorcycles? 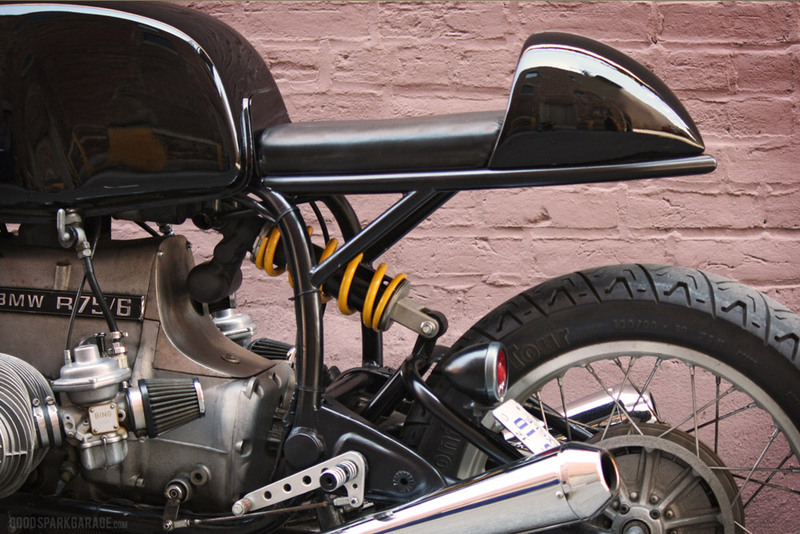 I did a cafe modification to a BMW R75/6 for a great friend of mine. Richard Pollock of Mule Motorcycles evidently commented on the bike. His comment was very positive and humbling. Having someone like him comment on my build was really cool. Phrase you use most around the shop? My most used phrase depends on if I’m trying something I’ve never done before…and it may not be appropriate for an interview!! Honestly though, since it’s just me in the shop, I tend to say to myself…”would I ride that?” If yes, then we’re good. If no, then time to rethink. I like being able to do what I want. If it doesn’t work, then I can do it again. It may cost me time, but I’m much happier with results I would want on my bike, not finishing fast. I like spending time with my family. I also like being outdoors in the woods or on a lake. Can I switch the question up on you and ask, If I could build a bike with anyone it would be?…Fred Krugger of Krugger Motorcycles. I really like his work and attention to detail. His bikes are amazing to look at. Next for me is trying to build my business a bit larger, but still a one man operation. I’m trying to get some nicer equipment to speed things up a bit. I also really want to try and see what I can do with a Ducati. 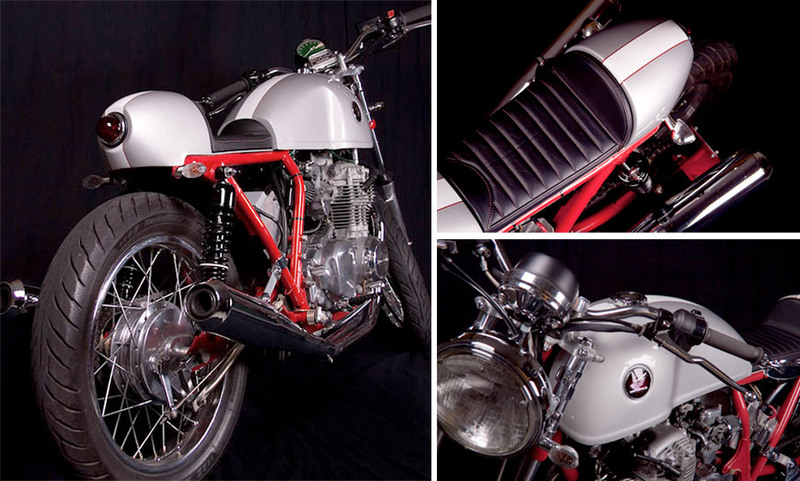 I love the trellis frames and think some nice aluminum bits would really be cool on a Ducati.